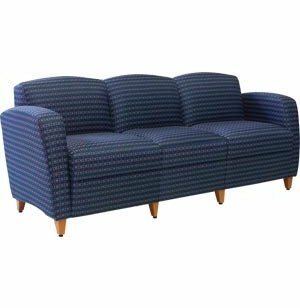 This reception sofa offers plenty of space for three people to sit comfortably, while waiting for an appointment or meeting. 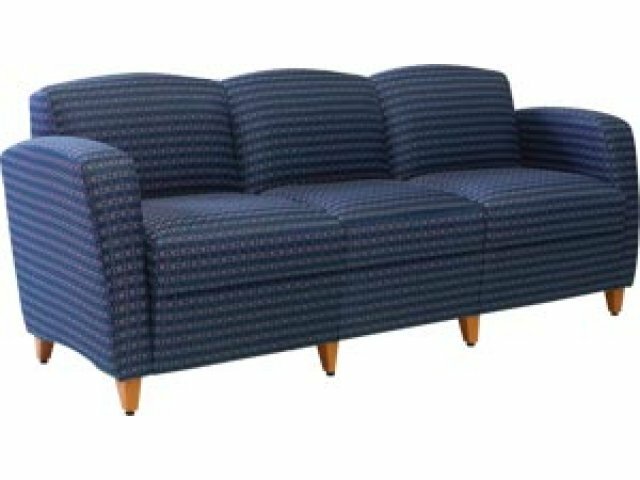 Accompany Reception Seating from High Point has an inviting, elegant style, which will make visitors feel comfortable in your waiting room or lounge. Cushy sofas and complementary occasional tables come in a selection of sizes, so you can choose the best combination for your space. The gentle curves highlight the generous, firm cushioning, which provides ergonomically-correct support. This reception seating fulfills the constantly-evolving demands of the modern business. No matter what service or product your company offers, providing a comfy place to sit will always make a good impression. Wood legs and upholstery come in a selection of hues, so you can choose the ideal combination for your space. With so many styles and options, you can get a custom arrangement for any layout. Personal Space: Generous armrests create private spaces in an open reception area. Firm Support: No-sag heavy-duty 8-gauge sinuous springs on the seat, and 11-gauge sinuous springs on the back, create a super supportive seat. Healthy Positioning: Firm cushioning with strong upright support facilitates ergonomically-correct positioning. Sturdy Legs: Wood legs with leveling glides are available in an array of appealing finishes. Extra Protection: Available in CAL 133. Call us at 888-793-4999 for pricing.